Bringing new levels of sophistication to indulgent Easter delights. 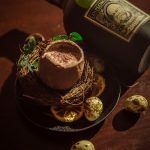 Melbourne’s latest and finest cocktail bar and live music venue, Jasper’s, today unveils its latest offering to the city’s chocolate and cocktail enthusiasts ahead of the nation’s Easter celebrations. Available from this Friday 12th April, Jasper’s signature old-world charm will be transferred to its meticulously handcrafted Easter cocktail ‘Goldie Flip’, a delicate amalgamation of vibrant, indulgent Easter flavors with a touch of nostalgia. Combining the indulgent textures of smooth, luxurious dark chocolate with the distinctive flavors of Diplomatico Rum and coffee bean, Jasper’s ‘Goldie Flip’ is served in a whole Easter egg, allowing guests to reminisce on childhood indulgences. Nestled perfectly in an ornamented nest and infused with a touch of cinnamon, orange, and house-made macadamia orgeat, the exquisite cocktail is complex, sophisticated, and unapologetically adventurous. 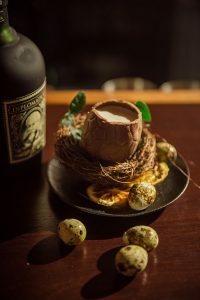 Jasper’s unique ‘Goldie Flip’ cocktail will be offered until the end of April, providing cultured Melbournians and chocolate fanatics an exclusive opportunity to indulge in luxurious Easter delights within an ideal ambience perfect for welcoming the long weekend. To complement the Easter cocktail, Jasper’s will continue to offer high-end signature cocktails, a world-class, rotating selection of craft gins, an extensive whisky selection and a carefully curated wine menu throughout the weeklong offering. Hidden away in Goldie Place with an iconic trumpet marking its entrance, Jasper’s world-class setting features smooth, live tunes, creating the perfect ambience for the sophisticated Melburnian. Jasper’s old-world charm continues through to the venue’s concealed courtyard of century-old exposed bricks featuring vibrant greenery, warm lighting, and soft acoustics that will have guests completely forget they’re nestled in the heart of the city’s CBD. Jasper’s is located at 14 Goldie Place, Melbourne, Victoria 3000. In a regular week, Jasper’s is open from Tuesday to Saturday Tuesday – Thursday from 4.30pm – 1am Friday from 4.30pm – 3am Saturdays from 6pm – 3am Live music from Thursday – Saturday between 9pm and 12am. Cover charge: There is a $20 cover for all live music shows, with some special events having higher-priced tickets.